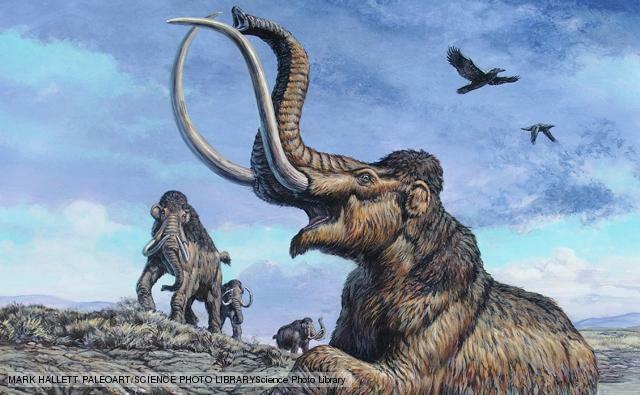 Bringing back extinct animals: hypothetical, inevitable, ethical? Dr Tamara Fletcher and I wrote an article for The Conversation on de-extinction - whether we can, and should, bring extinct species back to life. We believe that de-extinction needs to be considered on a case-by-case basis per species. The health and well-being of the individual animals, whether they can fill a currently vacant niche in an ecosystem, and what affect they have on their new ecosystem will vary widely between, say, a woolly mammoth versus the gastric brooding frog. Have a read of the article if you'd like to know more about the de-extinction debate. One thing is for sure - we won't be seeing real live dinosaurs any time soon. Image from Jurassic World, by Universal Pictures. De-extinction & Jurassic World in the real world. ABC Gold Coast 91.7 - Drive Time, 9th June 2015. ABC Adelaide 891 - Afternoons, 10th June 2015. 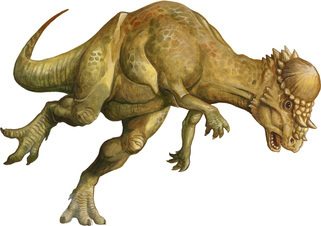 Could dinosaurs roam the Earth once more? Should we delve into de-extinction? As palaeontologists, we understand the desire to bring ancient animals back to life. It could answer so many questions about these enigmatic creatures: How did they behave? How did they grow? And what colour were they? Indeed, what could possibly go wrong? Surely if we kept these animals in a pen on an island without a scheming thief unlocking all the gates on a stormy night, we would all be safe. Humans often seem to act with little regard for their environment. We have seen the consequences borne out in the rapid extinction of animals and plants in countries where humans are the newly introduced species – the exotic invaders. Even when humanity and their natural environment are apparently in harmony, new arrivals with different cultural practices can throw the whole system back into turmoil. We only seem to understand the consequences of our actions in hindsight, and sometimes not even then. De-extinction could be seen as a path for redemption, to ease us of our guilt. We can finally bring back long-dead fauna and flora that we had a hand in wiping out. But to what end? It is our belief that we should only resurrect species that still have niches available to them in ecosystems that are struggling in their absence. This is not a new idea. With all the recent hype around resurrecting woolly mammoths, Beth Shapiro, author of How to Clone a Mammoth (Princeton University Press, 2015) was quoted as saying, “I probably should have called the book, How One Might Go About Cloning a Mammoth (Should It Become Technically Possible, And If It Were, In Fact, a Good Idea, Which It&apos;s Probably Not)” (Callaway, 2015). We agree, and wonder if these resources are likely better spent protecting the environment we do have, and repairing the environmental damage we’ve done, and are currently doing. Old species, new invasive: What modern day niche would the Columbian Mammoth, Mammuthus columbi, fill? For now, technological limitations render ethical arguments somewhat moot. The only available way to currently recreate past environments is through historical records and palaeontology: the study of ancient organisms and the traces they left behind, whether they are bones or teeth, carapaces of insects or footprints of any animal, leaf impressions, wood, pollen, and the list goes on. When it comes to reconstructing whole environments, looking to modern analogues can help us out. Does the pattern of plants in the fossil record look similar to any modern environments? Does the pattern or rings in wood occur in any climatic conditions now? Do any known modern animals leave traces like those left behind in ancient sediments? While as palaeontologists we can explore ancient environments, we may never know for certain exactly how a species behaved. For example, footprints left behind by modern birds engaging in mating displays may indicate that certain repetitive patterns of movements were used, and we might be able to hypothesise that these animals were engaged in mating behaviours. But we wouldn’t know just from those prints what their wings were doing, or what their call sounded like. That said, if we brought these animals back would they even behave like their ancient counterparts, if born of the lab and raised by humans? De-extinction may be an interesting and worthwhile thought experiment, and it may even raise awareness of the plight of modern endangered species, but for now we are safe from the island of dinosaurs, and even the dodo. Callaway, E. 2015. Mammoth genomes provide recipe for creating Arctic elephants. Nature News, 1st May 2015. http://www.nature.com/news/mammoth-genomes-provide-recipe-for-creating-arctic-elephants-1.17462. Accessed 6th May 2015. Drones and dinosaurs, the perfect partnership! 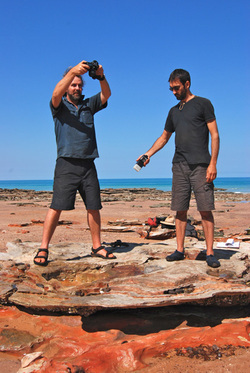 Our lab (UQ Vertebrate Palaeontology and Biomechanics) has teamed up with CSIRO, Airborne Research Australia (Flinders University), and the Goolarabooloo Traditional Custodians and Yawuru Native Title holders to map 130 million year old dinosaur footprints along the Broome coastline in Western Australia. Find out more over at the news@CSIRO website: "Walking With Dinosaurs: Advanced science recreates ancient past." There will be more updates about this exciting project over the coming months on this blog. And if you'd like to see regular updates about this project, you can follow Dr Steve Salisbury (@implexidens) and Dr Anthony Romilio (@a_romilio) on Twitter. 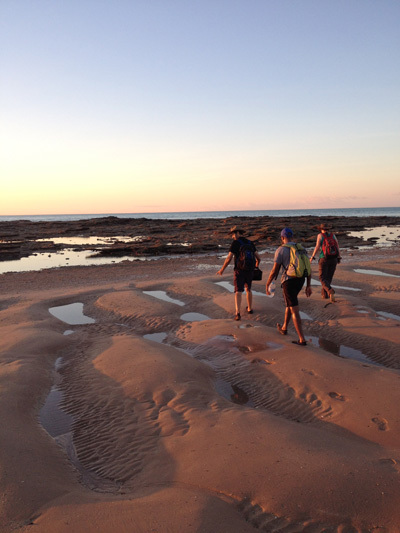 We are looking for motivated PhD and Honours students to help research the dinosaur tracks of the Broome Sandstone on the Dampier Peninsula, Western Australia. 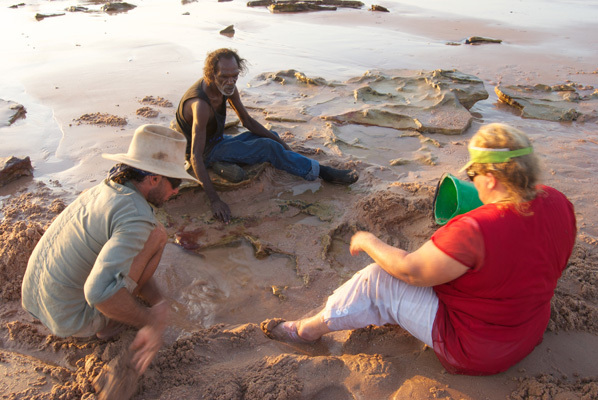 The Kimberley’s ‘dinosaur coast’ preserves what is arguably one the largest and most significant stretches of dinosaur track-sites in the world. Despite recent National Heritage listing, the majority of these tracksites are largely undocumented, such that their full scientific significance is poorly understood. 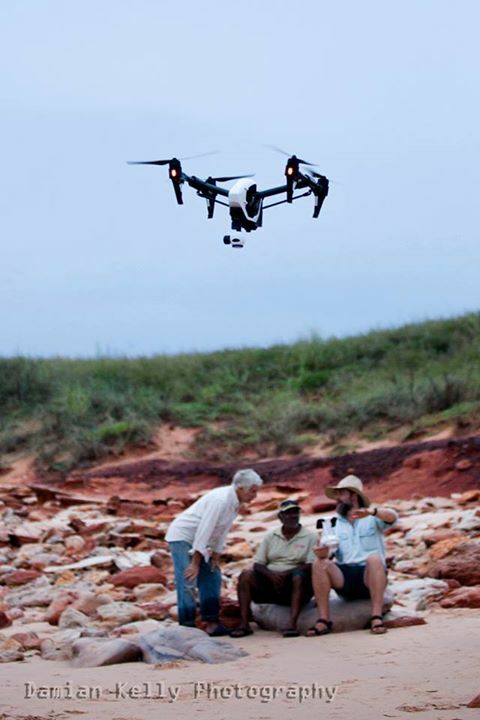 As part of a three year ARC Discovery Project (2014­­–2016), our aim is to digitally map the dinosaur tracksites of the Dampier Peninsula, utilising high-resolution aerial photography with both manned and unmanned aircraft, airborne and hand-held LiDAR imaging, and digital photogrammetry. The results will allow us to construct high-resolution, 3D digital outcrop models of the tracksites, and bring the 130 million-year-old landscapes back to life. All projects are expected to involve some amount of fieldwork, and funding is set aside to facilitate this. The ARC project will nominally involve three ~10 day field trips each year, with the timing contingent on tides and weather conditions. 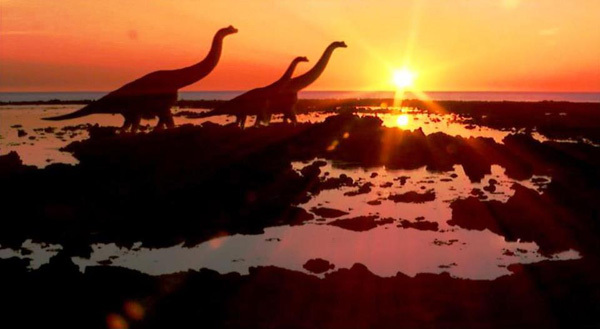 For more background information on the Dinosaur Coast and the recent battle to save it from large-scale industrial development, click here. For more information about other potential Honours and PhD projects in the Vertebrate Palaeontology and Biomechanics Lab, click here. 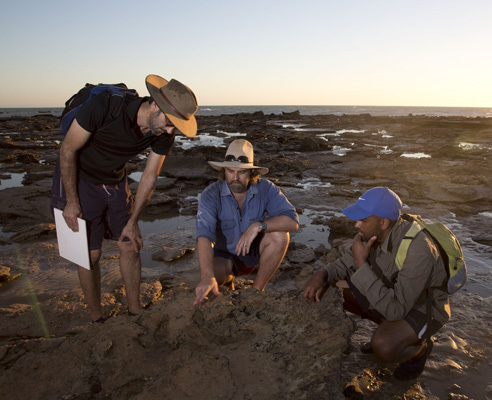 All our research is conducted with the consent and collaboration of the area's Traditional Custodians and the Broome Dinosaur Trackers. 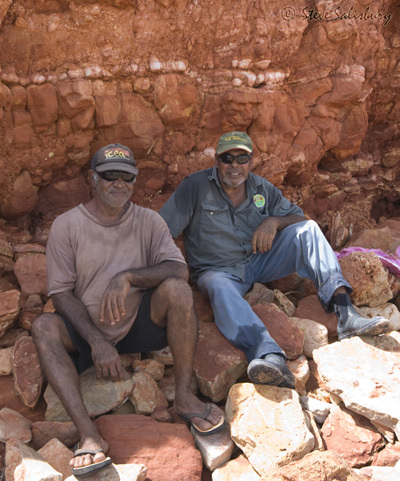 Goolarabooloo Law Boss Phillip Roe (left) and Yawuru elder Micklo Corpus (right) during a recent fieldtrip. Photo: Steve Salisbury. For more information about Honours in the School of Biological Sciences, click here. Acceptance into UQ's PhD program is contingent on a meeting the UQ entry requirements. Overseas applications are encouraged, as the School of Biological Sciences has made available a number of competitive international PhD scholarships. The Cretaceous ghosts of Walmadany. Image: ABC graphics designer Toby Goulding. As palaeontologists, we spend quite a bit of time trawling the internet to keep up-to-date with new fossil discoveries and hypotheses. The UQ Palaeo Blog is a great place for us to let you know about the interesting and exciting ideas we've uncovered, such as this new study on the preservation and taphonomy of pachycephalosaur skulls. I always feel a sympathetic headache come on when looking at these pictures. Images from top left clockwise: rareresource.com; Maichol Quinto and Florian Stitz - Paizo Publishing; Ryan Steiskal; Wikimedia Commons. Extra, extra! Get your ancient reptiles here! Queensland and northern New South Wales dinosaur fans rejoice: for the next 4 weeks our regional newspapers, including The Queensland Times, The Morning Bulletin, The Coffs Coast Advocate, The Sunshine Coast Daily, and The Northern Star, are handing out tokens for the 'Dinosaur' Collector Card series! One token from the newspaper can be redeemed for 2 collectable cards from participating newsagents. I say 'dinosaur', because the 40 cards you can collect feature not only dinosaurs, but also flying reptiles (including Dorygnathus and Anhanguera), an ancient marine reptile (Mesosaurus), and one therapsid (Estemmenosuchus), giving you more bang for your palaeo-buck! 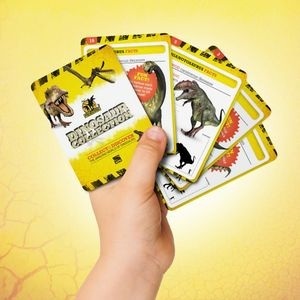 If you visit the Prehistoric Playtime website (here's the link via The Northern Star), you can also play some dinosaur themed games online, including one where you hurl meteors at some hapless dinos! 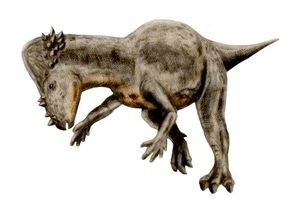 There is also a chance to win some dinosaur figurines, a link to an online quiz which will be made available during Dino Week (Monday, June 2 to Saturday, June 8), and some fun facts on the homepage. Nice to see a common mistake about our flying reptile friends cleared up! 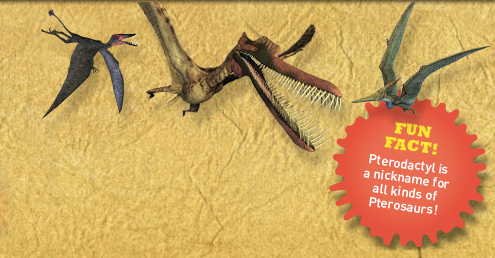 Image taken from the Prehistoric Playtime website. If you want to learn more about these ancient animals, Dr Steve Salisbury from The University of Queensland (the head of the UQ Palaeontology Lab) will be hosting an online palaeontology Q&A session on Tuesday, June 3 from 11am to 12 noon. You can ask him questions during the session, or email your questions before the session begins to marketing@apn.com.au. Be sure to visit your favourite newspaper website and sign up for a reminder email so you don't miss out! These cards are available to collect between the 17th May to the 21st June. So, get collecting!